Earlier this month, Samford University senior Anderson Gass stood on the South Lawn of the White House as President Barack Obama welcomed Canadian Prime Minister Justin Trudeau on his first official state visit. Observing the two world leaders address the crowd and review the troops was a highlight of an already amazing spring semester at the Washington Center for Internships and Academic Seminars, Gass said. Gass, Chandler Foust and Megan Walker comprise the first cadre of Samford students to spend a semester as a group at the Washington Center (TWC), which offers courses and internship opportunities in fields as varied as politics, law, international relations, communication, public service, business and the arts. 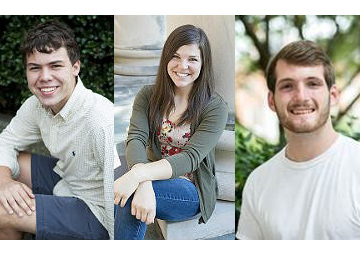 The three, who represent different academic majors and career goals, are taking full advantage of TWC’s course offerings and internship opportunities as well as its location in the nation’s capital. As an intern at the Center for International Policy, a foreign policy think tank, Gass works with the organization’s Win Without War Coalition and Arms and Security Project. “An average day can involve following congressional activity by watching a committee hearing and preparing a report of member opinions, tracking presidential candidate comments on foreign policy developments, and attending expert forums addressing global security issues,” said Gass, who has heard a talk by U.S. Secretary of Energy Ernest Moniz and a discussion of Middle East peace policy by a panel of journalists and scholars. In addition to his internship, the political science major is enrolled in a political psychology course that focuses on voter behavior and psychological theory, and he attends a weekly colloquium that provides leadership and career development training. “Combining my Samford academic foundation with the career development and interaction with policy experts available at the Washington Center has provided me with a firm foundation as I transition into graduate school and eventually the work force,” said Gass, a senior from Knoxville, Tennessee, who spent part of spring break visiting a potential graduate school. Such positive comments are gratifying to Samford Associate Provost for Academics Chris Metress, who serves as the university’s liaison to TWC. “He’s having exactly the kind of experience we are hoping this affiliation will generate,” Metress said of Samford’s partnership with TWC, where previous Samford students have studied during summer and Jan Term sessions. Walker, a junior public relations major from Cullman, Alabama, appreciates the opportunity to learn from prominent professionals and guest speakers. Walker’s media in politics course, Road to the White House: 2016, is taught by C-SPAN’s Steve Scully. “He imparts so much real-world knowledge about what we are learning,” Walker said of the “charismatic” instructor and network host, political editor and senior executive producer. As an intern at the World War One Centennial Commission, Walker works on an outreach team that encourages each state to establish a commemorative body for the centennial. In addition to representing the commission at a conference in February, she was the video production assistant at a memorial design announcement at the National Press Club. “Currently, the cherry blossoms are in full bloom, which is more beautiful than I can describe,” Walker said. Foust particularly enjoys the professional track events, in his case international affairs, that he attends each Friday. “I’ve had the opportunity to visit the Organization for American States, the Saudi Arabian Embassy, U.S. Agency for International Development, the Pulitzer Prize Center and meet with a current Foreign Service officer at the State Department,” said Foust, whose academic course is Rising China: U.S.-China Relations in the 20th and 21st centuries. “The highlight of my internship experience is simply the chance to perform actual work in the international trade and development field,” said the junior international affairs major from Bentonville, Kentucky, who interns with an international agribusiness company. So far, he has written project proposals and newsletters, and researched regulations and trends in global carbon markets. “While this internship has shown me that I won’t be seeking a career in agribusiness, it has provided me the opportunity to get hands-on experience and find out what I like and don’t like about the field,” he said, predicting that the knowledge will be invaluable to his future career path. In addition to academics and internships, the students get to build relationships with peers from around the country and across the globe. They are among 400 participants from 15 countries and 140 colleges and universities who are enrolled in TWC programs this spring, according to Lauren Womack Johnson, a 2011 Samford graduate who is its manager of marketing and communication for college and university relations.